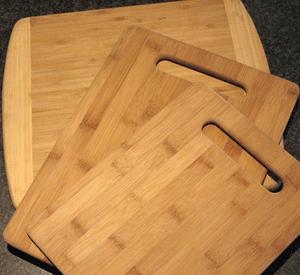 Bamboo cutting boards have become the eco-friendly answer of the new century and bamboo is quite a wonder. It looks super cool and is lightweight but strong. It’s tight-grained and dense, so it’s easy to clean. What’s not to like? I can’t in good conscience recommend bamboo as the material of choice for your main cutting board. So I can’t in good conscience recommend bamboo as the material of choice for your main cutting board. But it seems fine as a supporting cast member. That’s how I use my bamboo cutting boards, anyway—for lighter roles like slicing up an apple or serving cheese. Especially since bamboo is so pleasing to the eye. I don’t think I’ve ever seen a bamboo board I didn’t want to buy immediately just to take home and look at. There are three other types of cutting boards worth discussing—the last of which, like bamboo, I don’t recommend for heavy usage. But you see it marketed on a lot of kitchen gear websites, so I thought it would be worth covering. 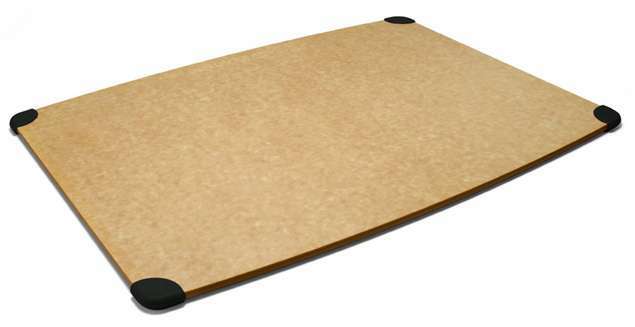 Hard rubber boards, the Sani-Tuff® brand specifically, are big in the food industry. And for good reason—they’re as pliant yet durable as wooden boards, won’t trap bacteria like plastic boards, are easy on knives, and can even be resurfaced by sanding. And to top it off, they can go in the dishwasher. So where’s the rub? The biggest downside is that they’re not that attractive—unless you have a thing for industrial beige. They look like they belong in exactly the place they were designed for—a commercial kitchen. They also lean toward larger sizes (which can be cumbersome and heavy), tend to grab your knife blade more than wood or plastic, and are not cheap. SANI-TUFF® BOARDS Here’s a link to (currently) the best-priced merchant: Sani-Tuff All-Rubber Cutting Board 12 X 18 X 1/2. You can also get them on Amazon through a third party seller, but they cost more: Cutting Board Sani-Tuff @ Amazon. Although their thinness varies according to the manufacturer, the big appeal of these plastic cutting mats is that they are ultra-light and ultra-portable. Which means you can stow them away anywhere—in a drawer, behind your knife block—and quickly whip one out whenever needed. Converts rave about the fact you can use the board itself to funnel whatever you’ve chopped up directly in a soup pot. Kuel. And they come in all sorts of festive colors like regular plastic boards, so you can easily code them for different foods if you like. I’ve never used them, but I can see the appeal. Mats are not designed for heavy-duty jobs. Please be aware though—depending on the thinness—you should, ideally, use them over something with some give in it like a wooden cutting board. If you put a mat that’s only a couple of millimeters thin over your granite counter and mince away with your favorite newly-sharpened chef’s knife, you will quickly fold over the cutting edge (i.e dull it). 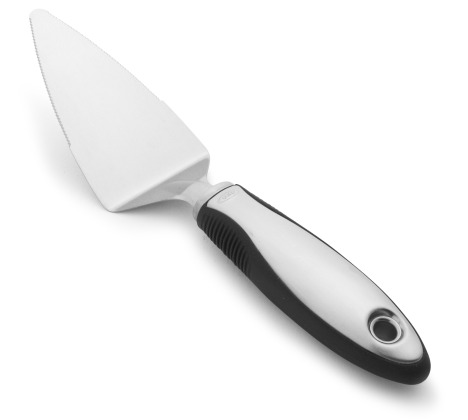 And please don’t even dream about chopping with a cleaver on one of these—you’ll slice right through. Mats are not designed for heavy-duty jobs. Also, be aware that, in general, they won’t hold up to sustained dishwasher use, but will warp and curl. Perhaps the best way to approach them is as a disposable accessory that might last for a year max. (They’re extremely affordable, depending on the brand.) Use them when you’re in a crunch—like slicing some fruit over a board you just smashed a garlic clove on—and once they get cracked and scarred, buy a new pack. Richlite, a leading wood fiber composite, is a wonderfully green material made of layers of paper pulp and resin. Epicurean makes a long line of Richlite cutting boards which are quite stylish and quite the rage. One can understand why—they’re incredibly durable, won’t stain easily, can take up 350 degrees of heat, are completely sanitary, and can even go in the dishwasher. There’s only one big problem—they’re pretty darn hard. Significantly harder than hard maple, which makes them less-than-ideal for heavy cutting-board use. Even though all the websites selling these boards claim they won’t dull knives, I don’t buy it. I ordered some samples to test out myself and they did not score easily enough (the way any material that will protect your knife edges should). I don’t recommend them as your main board. I own this pie server and I LOVE IT! Two reasons: 1) you can use the serrated edge to actually cut a crisp pie crust, 2) it’s designed with just the right shape and flexibility to enter a pie dish and extract a slice without mangling the pie. Sweeeet! In the end, as far as your knives are concerned, the two best all-around materials for cutting boards are still hard wood and plastic—which you don’t have to choose between, but can use in combination. 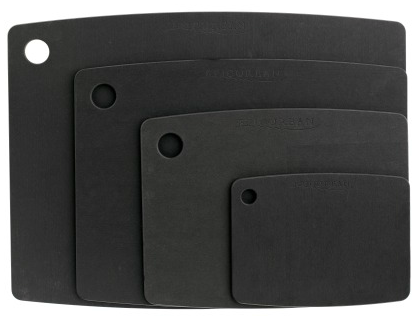 (Sani-Tuff boards made of hard rubber are also a viable option if you don’t happen to mind their industrial appearance.) If you love the look and feel of materials like bamboo and Richlite, try not to use them as your main board for major chopping. They will be harder on your knives than wood or plastic. Better to relegate them to the supporting cast. Take care what your knives cut on and they will return the favor by staying sharp longer! cons: hard on knives; should only use lightly as backup—bread, etc. Nonetheless, I’ve noticed this phenomena of contradictory reviews on Amazon quite a bit over the years with a variety of products—although it seems particularly vivid with cutting boards. And I’m guessing one thing that might account for it is the fact that there must be a wide range of how people treat their cutting boards. . . I was wondering: Which type of wood do you think is the best choice in reference to “being nice” to knives? Not too soft, but not too hard? Now I’m in the market to replace my heavy 10 x 14 inches polypropylene board that I just hate. I’ve been looking at the Epicurean Richlite boards, but I don’t want to dull my knives. First off, please please please stop doing your major cutting on bamboo. You’re just beating up your knife edges! In both posts, I discuss some of the issues you’re wondering about. But in a nutshell—hard maple is one of the best, easy to find, and inexpensive woods to use for cutting boards. If you want something more exotic, you can try Hinoki which is more expensive, but a wonderful wood. I can see why you’d want to replace a large polypropylene as your main board. . .ugh! If you’re like me, and you don’t like lugging around thick heavy boards, then I highly recommend the 3/4 inch thick, 14 x 17 board by J.K. Adams. The only caveat is that you must care for it properly by: oiling it regularly, always getting both sides wet when washing, NEVER immersing it in water, and ALWAYS drying it off and then letting it air dry. I bought one a year ago and I love it and it’s holding up very well (not warping). But I take care of it!! Please feel free to follow up if you have more questions! Quick follow-up q: did you mean J.K. Adams or John Boos? I don’t find a John Adams board anywhere. Duh. . .my fault. . .J.K. 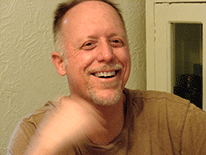 Adams. I’m researching replacing my pull out cutting board and your information was helpful! Have you ever tried a cork cutting board? I love mine for many reasons but for knives they are great and they naturally heal from knife “wounds”, unless you use a serrated knife (don’t ask how I know that! ).